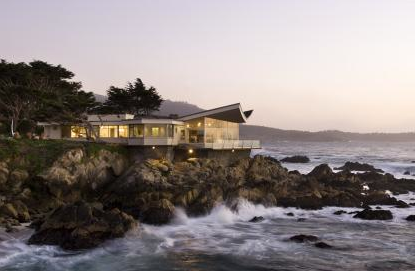 This house in Carmel, California is a vintage beauty. Known as the “Butterfly House”, it was designed in 1950 by architect/owner Frank Wynkoop and restored by his sons recently. Find out more about the home at trendsideas.com: architecture, kitchen and bathroom design: Turn of the tide. I could live in this. And you? What a day for Love & Relationship! 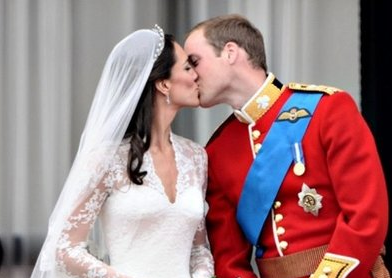 The Royal Wedding of Prince William and Kate Middleton took place this morning. Congratulations to this beautiful couple. 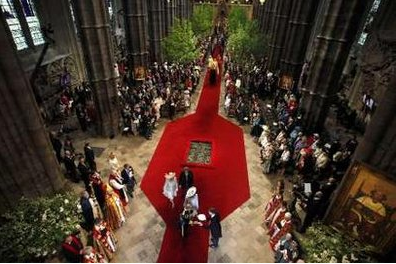 Inside Westminster Abbey the nave was lined with 20 foot tall potted English field maples, bringing nature inside the gothic cathedral. The trees will be planted at Highgrove after the ceremony (it’s a green wedding!). The English field maple symbolises humility and reserve, and was used to make loving cups in medieval times, while the hornbeam signifies resilience. Apparently Kate knows the importance of symbolism and chose wisely. Symbolism is an integral part of feng shui and Feng Shui By Fishgirl feels this is a very auspicious beginning for the pair. Now let’s talk wedding dress: I’ve heard comparisons to Grace Kelly’s dress but I was reminded of a very young Elizabeth Taylor when I saw Kate in her splendor this morning. Maybe it’s Kate’s gorgeous mane of dark hair that reminds me of the late great Liz. In any case, the dress designed by Sarah Burton under the Alexander McQueen label definitely has a 1950’s demure quality to it. The nipped in waist with flaring skirt, the chaste deep v neckline, the traditional lace…the LA Times reports that the skirt was meant to echo an opening flower and that Kate wanted to represent lacemakers of the Arts & Crafts Movement. What do you think? Did you watch the Royal Wedding? Did you like Kate’s choice of dress? 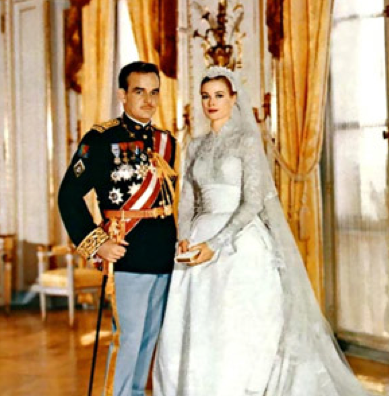 Grace Kelly on her wedding day to Prince Rainier of Monaco. 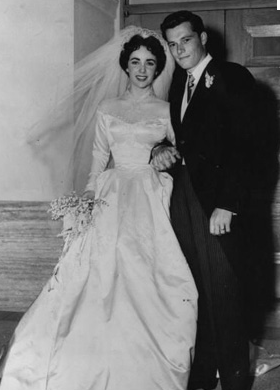 Elizabeth Taylor (and Eddie Fisher?) on their wedding day. 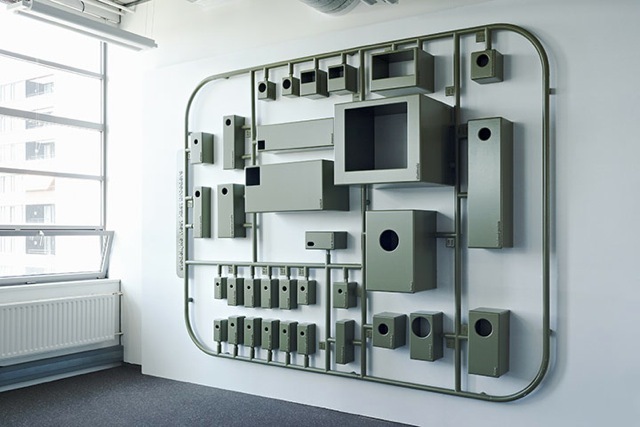 A wicked birdhouse condo complex from the Milan Furniture Fair 2011. 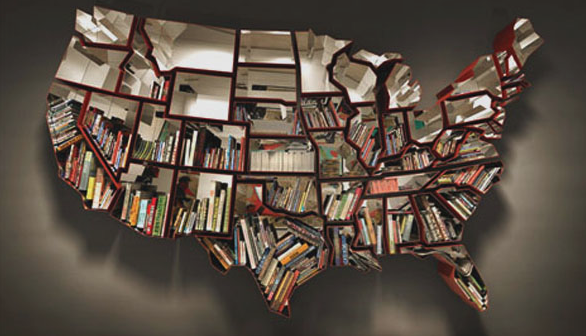 USA bookshelf by artist Ron Arad. Don’t you just think this is the most cleverest bookshelf you’ve ever seen? I think it’s an art piece so don’t get all critical about the functionality. As more of us turn to digital e-readers like Kindles and Nooks and iPads, books may end up serving as objets d’art after all. From a feng shui manifestation viewpoint, I would put all my raciest liberal subversive books in the Texas and Florida sections of this Ron Arad bookshelf. Hehehe. A digital giclee print from m-dc. Hanging art in your crib lifts ch’i energy. It’s important to get the scale right. If you have a large wall, fill ‘er up! If you aren’t a DIYer you can still find inexpensive ways to fill a wall with creativity. Take for example the digital wall art shown here from Modern-Digital Canvas— “Love”– is a 43″ x 58″ print on stretched canvas. Although it is an obvious riff on the original by Robert Indiana, it’s a good symbol of Love to place in your Love & Relationship area. If I were too lazy to paint something myself, I’d order this print and then paint the white parts another color like red or pink (or maybe paint each section different colors). Then I’d slap some varnish over the entire thing to make it even more difficult to discern if it was an original painting or a print. Stretched fabric from Textile Art comes in a kit you stretch yourself. Another good way to put up some larger art pieces is to stretch some fabric on stretcher bars. Textile Art has a great selection of kits (the one above is $125) or you can find your own fabric (vintage textiles such as tablecloths and kimonos? You decide!) and buy the bars at an art supply store. Decorative wall decals are another art solution. The one shown here is $13.99 from Amazon.com–a steal when you compare it to a handpainted mural. I always choose to go with original art and to support living artists whenever possible (after all, I am one myself!). But if you cannot afford originals, be original yourself. Don’t live with bare walls–your feng shui needs visual art. Bon Bon cupboard by Hiroshi Kawano. This bathroom follows the curves of the Mandela Custom Home walls. 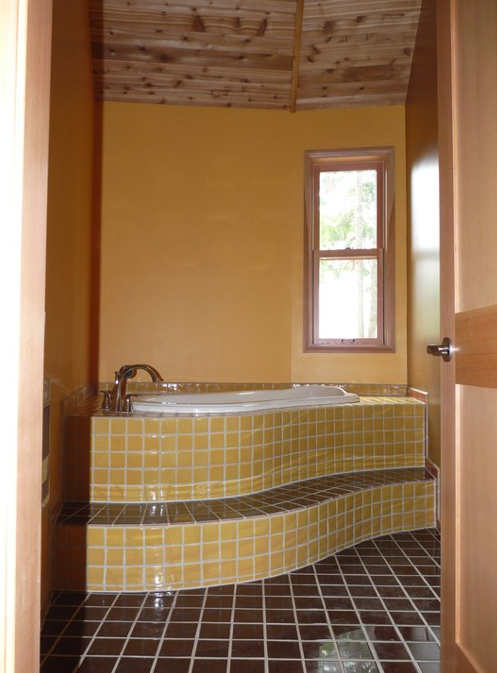 The tub and the tiling has beautiful curves. 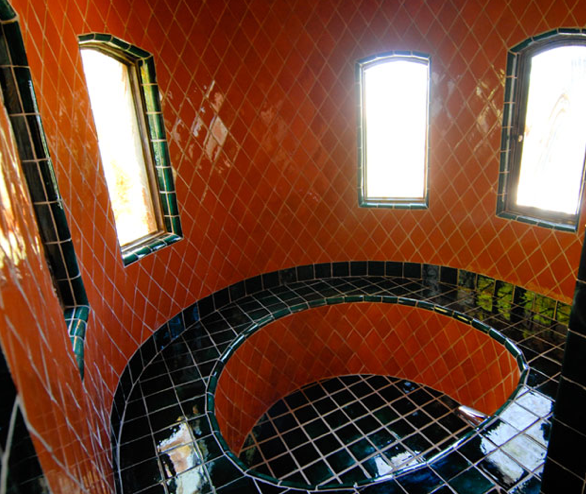 The "bracelets" are a stairway to the soaking tub by Tub-E.
Classic ceramic tiles for a totally circular bathing tub. This teak wood bowl tub is the bomb! 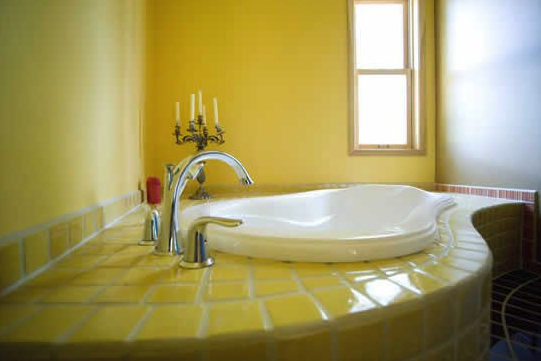 Adding curves and circles to your bathroom is adding yin energy feng shui–and these bathing beauties make me want to take a bubble bath, pronto! Will you join me?